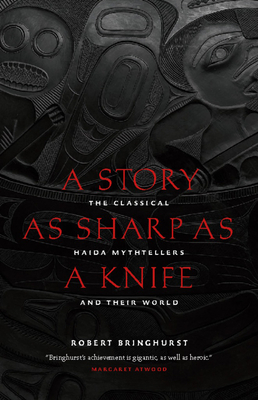 If as a recent New York Times article on the making of the film, Edge of the Knife, says, there are fewer than twenty fluent speakers of Haida alive today, Robert Bringhhurst's reclamation of these recorded Haida myths - the written versions, for the most part, filed away in drawers and boxes thousands of miles away - would seem to be even more important. Linguist and ethnographer John Swinton in 1900, ostensibly under Franz Boas' tutelage, but then under the sway of such Haida mythtelling poets as Skaay and Ghandl, copied down epic poetic pieces as they were narrated. Others have made the case that what Beowulf is to the part of the world it comes from, these stories are to this part of the world. Fundamental beauty and imagination are at work here, along with Bringhurst's keen insights on story, myth, culture, landscape, history - all the elements. The Haida world is a misty archipelago a hundred stormy miles off the coasts of British Columbia and Alaska. For a thousand years and more before the Europeans came, a great culture flourished in these islands. The masterworks of classical Haida sculpture, now enshrined in many of the world's great museums, range from exquisite tiny amulets to magnificent huge housepoles. Classical Haida literature is every bit as various and fine. It extends from tiny jewels crafted by master songmakers to elaborate mythic cycles lasting many hours. The linguist and ethnographer John Swanton took dictation from the last great Haida-speaking storytellers, poets and historians from the fall of 1900 through the summer of 1901. His Haida hosts and colleagues had been raised in a wholly oral world where the mythic and the personal interpenetrate completely. They joined forces with their visitor, consciously creating a great treasury of Haida oral literature in written form. Poet and linguist Robert Bringhurst has worked for many years with these century-old manuscripts, which have waited until now for the broad recognition they deserve. Bringhurst brings these works to life in the English language and sets them in a context just as rich as the stories themselves--one that reaches out to dozens of Native American oral literatures, and to mythtelling traditions around the globe. The world of classical Haida literature is a world as deep as the ocean, as close as the heart and as elusive as the Raven, whose unrepentant laugh persists within it all. This is a tradition brimming with profundity, hilariy and love. It belongs where Bringhurst sees it: among the great traditions of the world. Bringhurst, an acclaimed typographer and book designer, will be redesigning this edition in a beautiful new package. Robert Bringhurst is one of Canada's most respected poets, designers and most probing cultural historians. He has been a Guggenheim Fellow, lectured on Native American art and oral literature at universities around the world, studies linguistics at MIT under Noam Chomsky in the 1960s, and worked as a professional translator from Arabic and Greek.He is the author of the bestselling treatise on typography Elements of Typographic Style. Bringhurst began to study the Haida language in 1982. His translations of Haida oral poetry have since appeared in major scholarly journals and in Brian Swann's groundbreaking anthology Coming to Light: Contemporary Translations of the Native Literatures of North America.